Post footings are also known as column footings or spot footings shown on footing detail 1 below. A post is defined in the dictionary as a long piece of wood, steel, concrete, or other material that is placed upright into the ground to serve as a marker or support. Another definition stated it is a vertical support or structure as a support for a beam in the framework of a building. With those definitions in mind, concrete footing details such as detail 1 shows how the footing and reinforcements are to be placed. 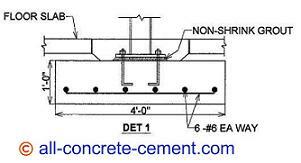 The terms post and column are used interchangeably which refer to a vertical structural member partially shown at the middle of the footing in det 1. When placing a post on concrete footings, the column must be centered at the spot footing in all directions. This will ensure the load transferred to the footings won't create eccentric loading which depending on the soil type can be problematic to the stability and lateral support system of the structure. For that reason the bolt patterns must be checked and verified at least once prior to the pour. A fence post also has footings but quite different from the column footing in detail 1. For one thing the vertical load for fences are very small, that's why fence footings are much deeper than they are wide. The fence footings for chain link fences are narrow but very deep, anywhere from 6 to 8 inches diameter by 18 to 24 inches deep. The increase depth will provide lateral stability. The thinness of the footing is primarily due to the limited vertical loads imposed on fences. The increased depth is intended to provide counter balance forces to resist wind loads. Due to the thinness and almost absence of vertical loads fence footing reinforcements are not required.